Masked loyalist paramilitaries erected more than 600 UVF flags in east Belfast last weekend along key arterial routes, without consultation or notification in an operation that involved cherry pickers operating in broad daylight. A loyalist march is to take place in the area this Saturday, and could involved up to 10,000 participants. 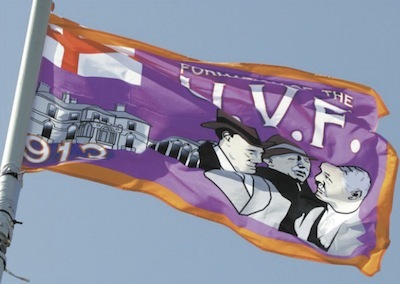 A PSNI spokesman denied the flags were connected to the UVF. Parade organisers also denied any connection to the loyalist paramilitary organisation and claimed the flags were only for “historical commemoration”. Alliance assembly member Chris Lyttle described the process as “sinister and a challenge for the rule of law”. “Residents who object to this behaviour were not consulted, the organisations concerned are regarded as paramilitary and government agencies have taken no action to remove the flags,” he said. A proposed meeting between the PSNI and community representatives has still not taken place on the eve of the march. Mr Chris Lyttle said he was unable find out when the claimed meeting was taking place. There were clashes between nationalists and the PSNI later in the week at a nearby interface when loyalists removed and burned an Irish tricolour flag. On Wednesday evening a small group of nationalist youths were gathered at the top of Mountpottinger Road in the Short Strand area of east Belfast when PSNI personnel arrived into the district and dispersed them for no apparent reason. A group of loyalists then moved on to the Mountpottinger Road and proceeded to take down a tricolour from a lamp-post. The PSNI chose not to take any action, even as the loyalists publicly burned the flag. Instead of moving the loyalists away from the interface area, PSNI personnel began attacking nationalists - young and old, male and female - inflicting serious injuries. In the ensuing clashes, a petrol bomb was thrown. eirigi said residents of the Short Strand had already had to endure weekly attacks on their area in the recent controversy over British flags on city hall. “The flag controversy and continuing protests and attacks by unionists illustrate the continuing reality of the sectarian state - as does the accompanying partisan policing by the PSNI, which we are constantly told has changed beyond recognition,” they said. “However, reality states differently. The Short Strand is an area which has endured the wrath of unionist bigotry, aided and abetted by the crown forces, throughout the present conflict and beyond. Sinn Fein councillor and former mayor Niall O Donnghaile said people in the district were “annoyed by the heavy-handedness of the PSNI”. “A couple of local people were injured and I will be raising this with the PSNI,” he said.